Everyone wants to be a king or a queen, so Dominica has Calypso Kings and Queens, National Queens, Mother's Queens, Miss Bold and Beautiful and in recent times, a Bouyon Monarch. I am thinking that with the nature of the Bouyon music expression which was born out of the collective efforts of a band, just as Cadence that poses, and will continue to pose, a difficulty for the judging of individual performances. Undoubtedly, a plethora of bands have emerged in the Bouyon musical genre over the last five years in particular. No longer is the load just carried by WCK, SERENADE, EFFECTS and PIK as obtained in the 90's but, most formidable, TRIPPLE KAY, SIGNAL and a host of others have come to the party. While the quality, to my mind, has deteriorated in lyrical content, vocal execution and musicianship, the music has grown even more popular among Dominican youth. Approaching 30 years old, Bouyon can only boast of one solo act of any significance in the person of the prolific Acer Bantan. Though certain elements of the music have been used by many regional artistes such as Machel Montano, Bungi and a host of others, who have gone as far as employing the services of local producers here, they call their composition Soca and so Bouyon remains within the shores of Dominica since there are no self-acclaimed Bouyon bands in the region. If there is nothing wrong with this picture, then you could stop reading this article now and conclude that I have a problem with Bouyon music because I am not from that school or age group. Did you say age group? Well, maybe this is part of the problem. The sound which emanated in the 90's from the originators and WCK and First Serenade appealed to all and sundry. There were the slow pieces that catered to dance and romance- brass, bass lines, decent vocal harmonization, the guitars of Martindale and Wayne; everyone was happy because the lyrics were of an acceptable quality. Now everything is about hype with little variety tailored for different age groups or moods as in the days of Balance Batty, Conch Shell, Beff La, Culture Shock, Champion Girl or Drum Song. Today much has changed but still, much has remained the same; Balance Batty and Conch Shell are still the two biggest Bouyon hits; and there's still an over-dependence on the drum machine and the lack of support from the private sector. What has changed for the worse is the quality of musicianship and song writing ability particularly since the more promising Bouyon writers of Rah, Skinny and Nayee are less prominent or prolific with the pen in recent times. The interesting times of Klockers and DICE with the fusion of R&B and Hip Hop, are no more. Benji and Acer are now the new Kings. 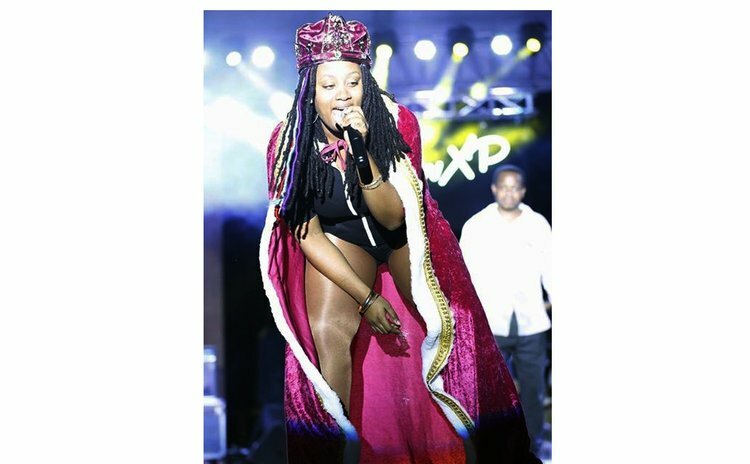 The only female Bouyon act and Monarch, for the second time, is now Charlene XP- a bright light in the genre since she's a good singer, performer and reasonable songwriter. Not many can boast of all these three attributes. However, Acer Bantan, the acclaimed, prolific King of Bouyon has the uncanny ability to string rhyme schemes and bring issues to light in his Bouyon-driven compositions with equally energetic performances and videos to compliment his marketing drive. Both Acer and Benji of the Triple Kay are the most sought-after artistes in the genre and Acer tours most frequently. Tarzi, arguably the best singer in the genre, plays second fiddle in a music genre which does not seem to place much emphasis on vocal quality and has resorted to chants more than well constructed composition. Yet, we are reminded that Triple Kay has the ability and have produced solid compositions and so have Signal, WCK and others as we speak, but sadly they too have fed their fan base with an overload of chants and questionable lyrics in their dances and live recordings that the youthful DJ's have fallen in love with this unfortunate music diet as the standards for the industry. It is also unfortunate that the most acclaimed front men in Benji, Acer, Lloydie, Nayee and Rah chose to stay out from the recent Bouyon Monarch competition. Many feel that they fear being beaten by lesser mortals which would have negative repercussions for their careers. They feel more comfortable in the fan base assuming that they may be the best instead of proving, as Dice and the Mighty Sparrow did in Calypso, by taking to the ring and proving to everyone they deserved the title "King of Bouyon". It's amazing that over 10 grand can be sacrificed to maintain ego or status! Most musicians in Dominican cannot claim to make $10,000 from their efforts annually far less in one competition. I agree with the Bouyon Queen and Monarch that they must come out and make the show a spectacle because without their presence as competitors the show will continue to fail in terms of audience participation. DFC consultant Val Cuffy deserves all credit for initiating a Bouyon Day, which the radio stations have taken on board. So If Bouyon is about a band (as I think it should) or there is merit in the excuses advanced by Kendel for their lead vocalist non- participation in the competition, then, have band competitions where the best Bouyon acts can be showcased and stop shooting in Bouyon's goal.